There are times that call for a warrior, and times that call for a statesman. Yet not always to those that are needed arrive, and it falls to others to fulfil these needs. Yet from these times can great progress be made, as the world is dragged to where it needs to be. 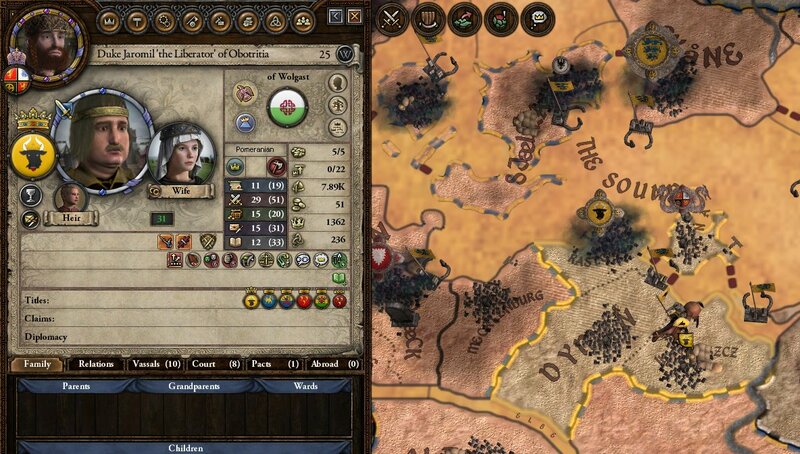 Thus begins the rule of High King Eirik, the Reformer. A man who was more at home on the battlefield ruled the North Sea Empire from Castle Lade. 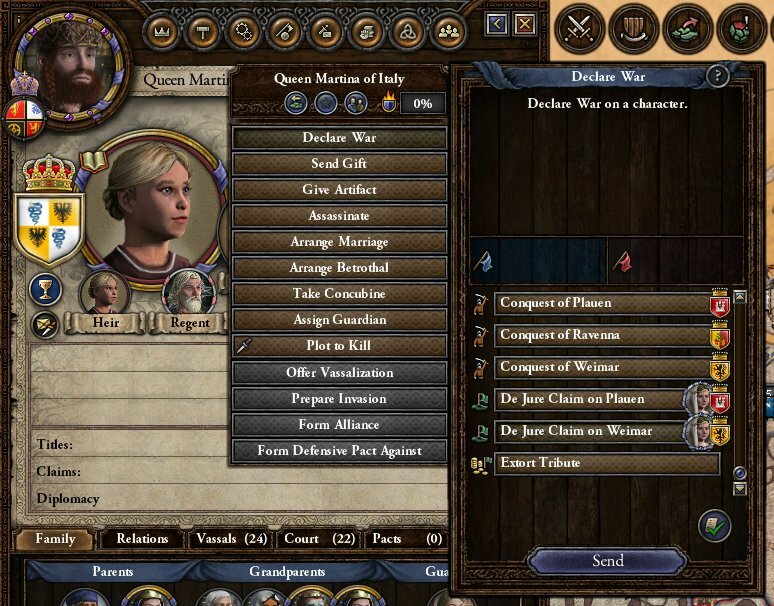 A skilled soldier, whose power on the battlefield was only matched by his determination to be remembered as one of the great rulers of the realm. His skill at court was only in the art of manipulation, seeing these this a kind of warfare itself. Already a widow, his first wife had only borne him a daughter, and although he was to be married again, it would be many years before this happened. With the betrothal cancelled between his daughter and the King of Finland, the death of the previous High King ended the war with Sweden. 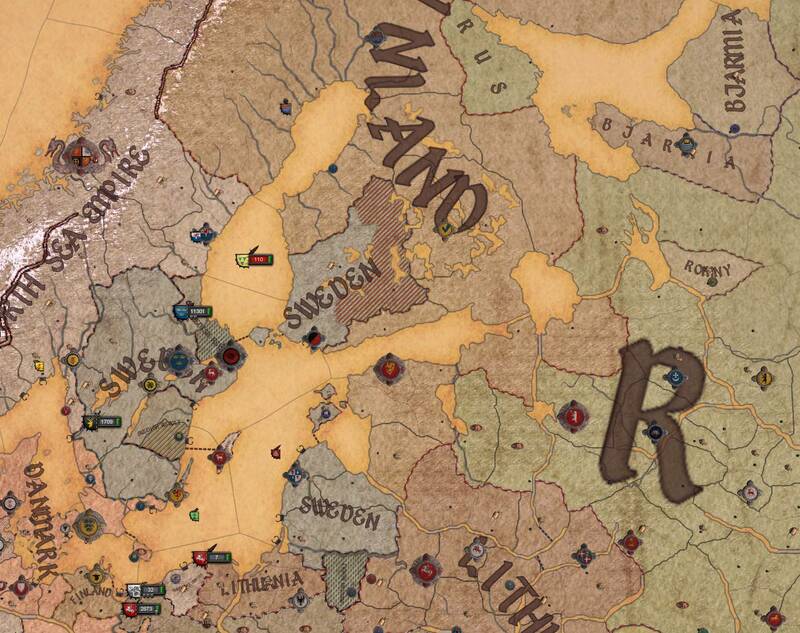 With the Finnish forces moving in from the east and rebels in the west, the Kingdom of Sweden was looking incredibly unstable. The Finnish would have to move quickly however, as the King of the Rus still held claims and ambitions for the crown of Finland. 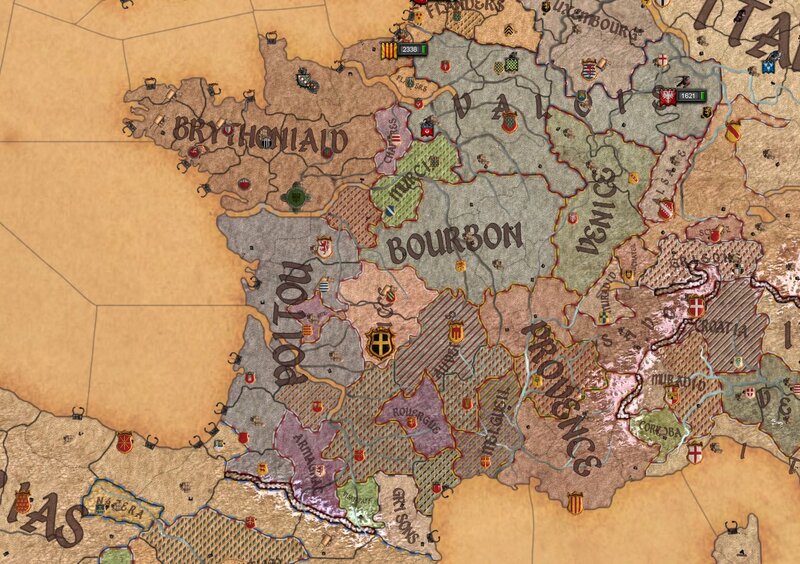 In the Catholic lands of the French, the once divided lands had started to unite behind a dozen duke. What once was ripe land for raiding and Welsh expansion had started to fight back, as the dukes of Francia looked to push invaders from their homelands. 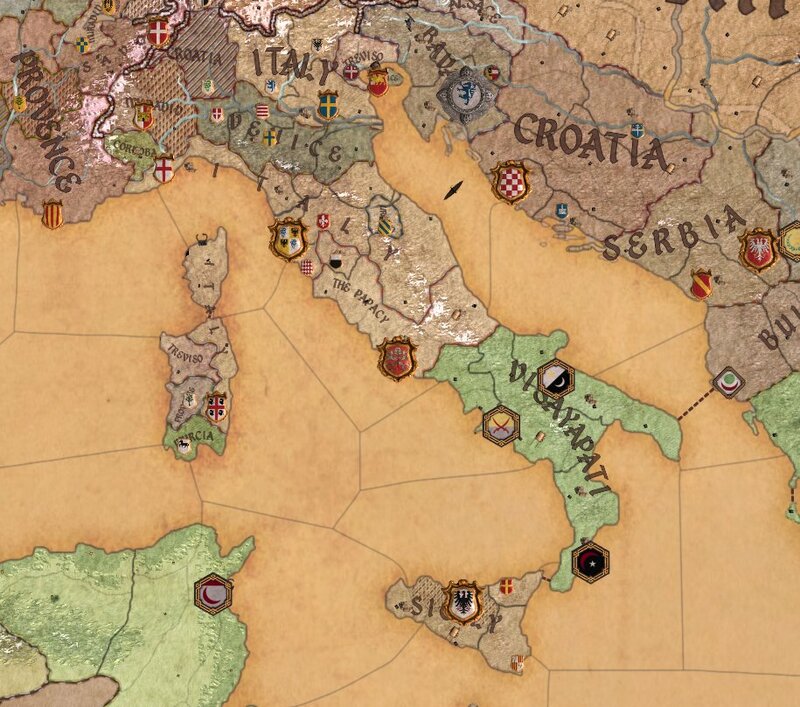 To the south, the seat of the Catholic faith was threatened as Muslims took the southern half of the peninsula. The King of Sicily was now just that, king of his island and of a faraway stretch in Iberia. With the ancient city of Rome now quite possibly on the frontlines of a future war, the Queen of Italy and the Holy Father were looking nervously across the borders at a horde that stretched from their own lands to the coast of Africa, Greek heartlands to the deserts of Egypt. 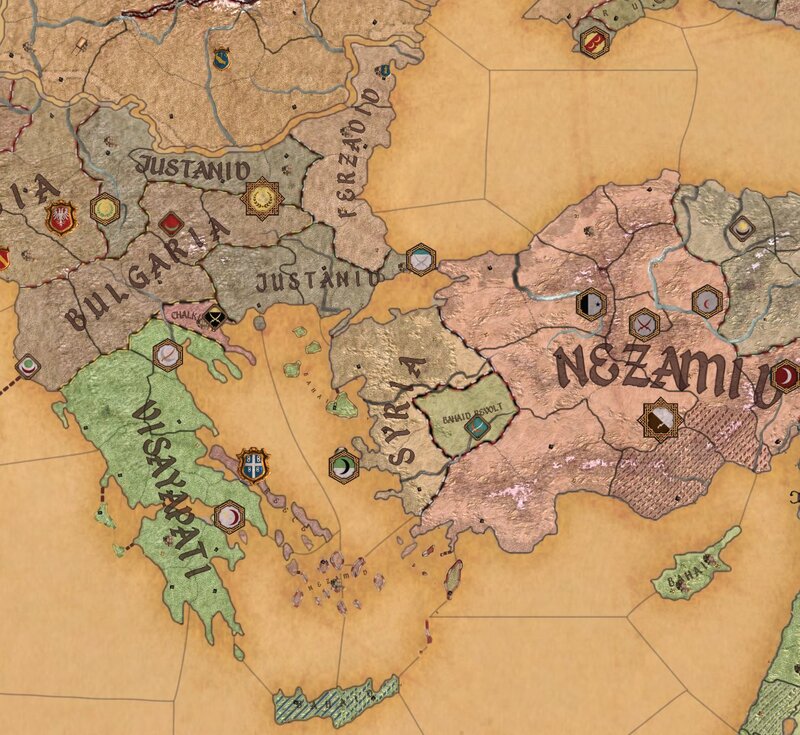 In the Bosporus, Catholic power has lost and Muslims again has triumphed. The King of Greece now only holds his small islands, a King in name only. 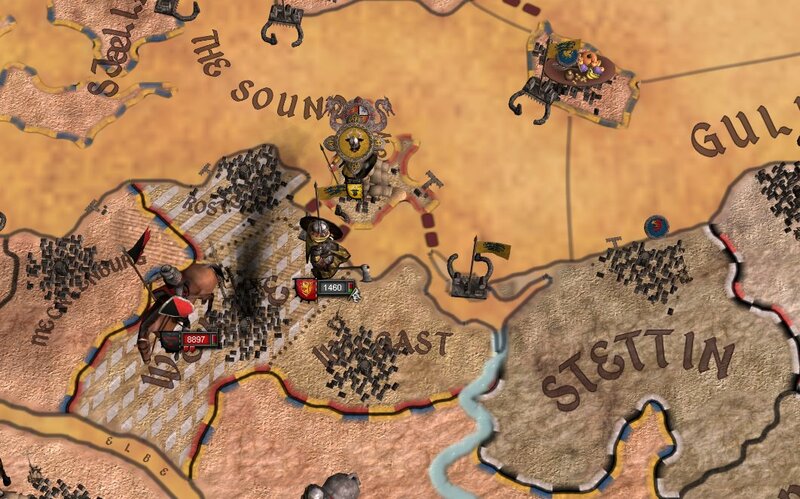 The powerful Justanid dynasty’s grasp of these lands is weakening, as the rebellious Sultan of Bulgaria is quickly claiming these lands as the Justanid’s turn to face the threat to their north. 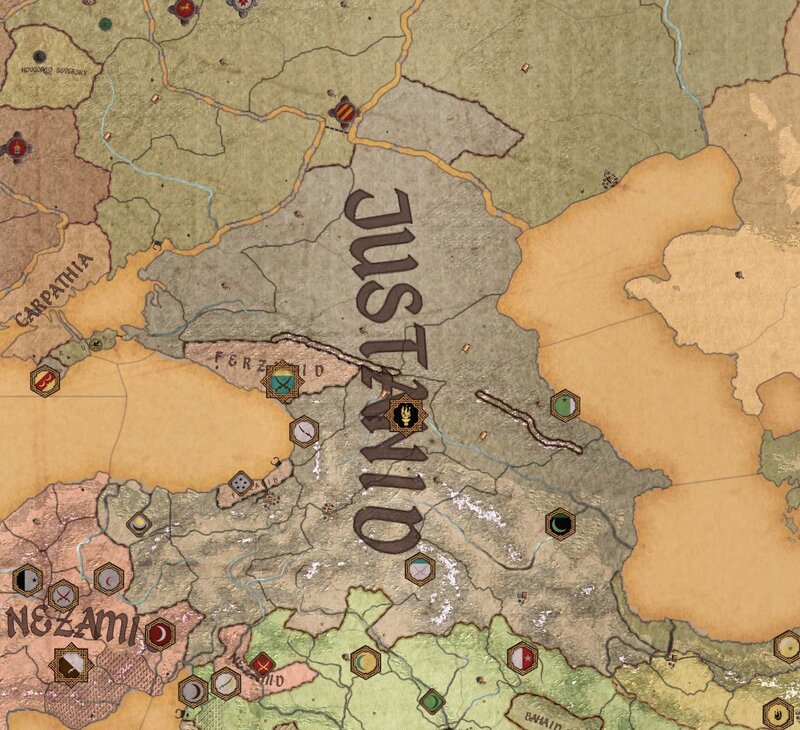 In the Caucasus Mountains, the Justainids had started to push into the exposed underbelly of the Rus kingdom. 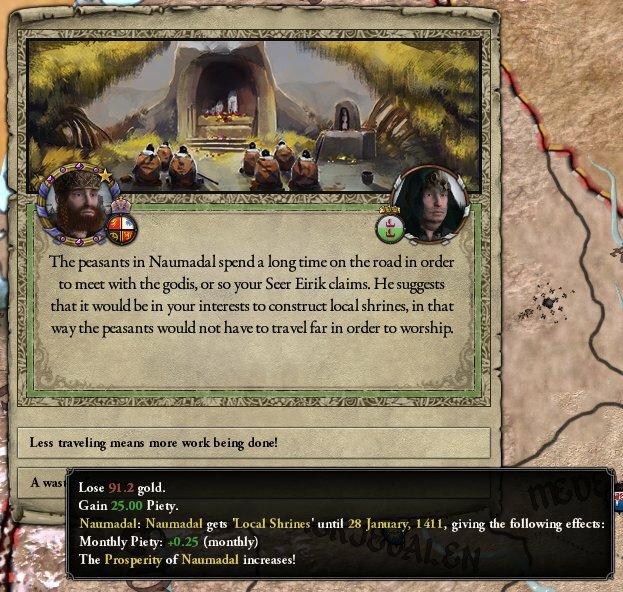 For a long time there had been peace between these two neighbours, however with the Carpathians attacking from the west the Muslim kingdom saw their chance to expand into the fertile Chrimea. Pushing up to the Volga and Don rivers, the Russians had now moved their focus to defending their southern borders. 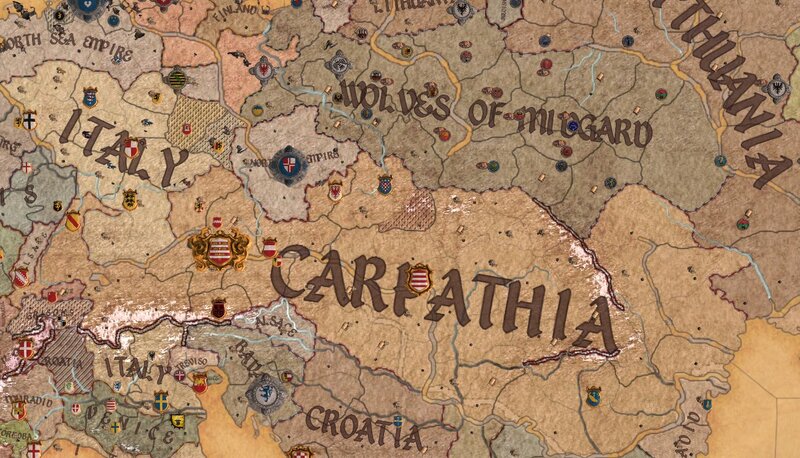 The Carpathian growth had come to a sudden stop as the realm’s inheritance had split the lands between two branches of the Mostichid dynasty. Whilst nominally a subject of the emperor, the King of Pannonia controlled the powerful, central lands as well as the historic capital of Pest. 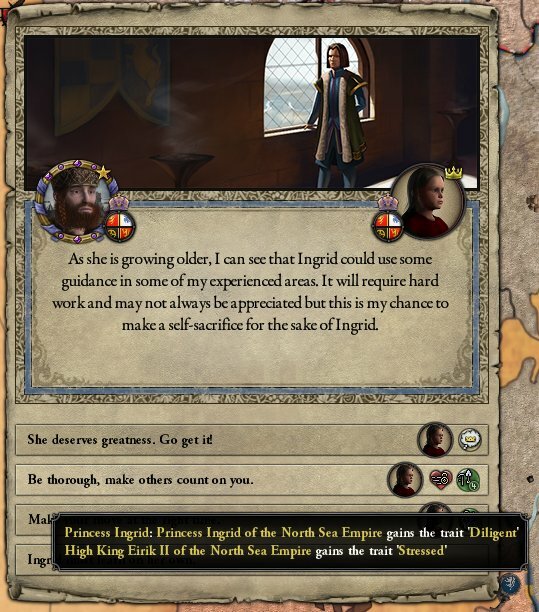 This allowed for great influence within the realm, and there had already been several tense power plays between the newly crowned emperor and king. 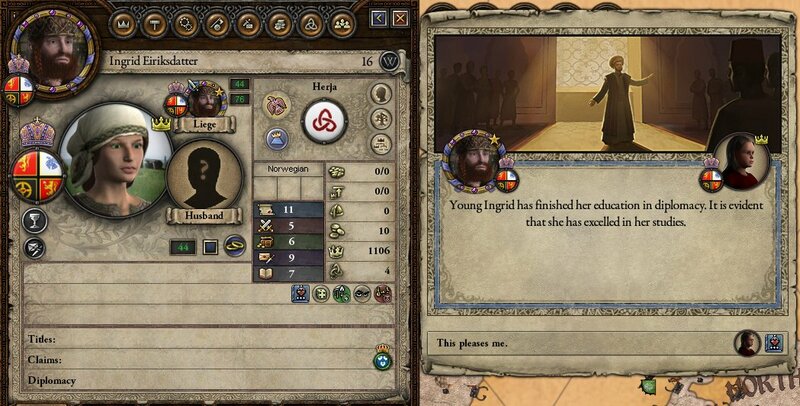 Whilst his father had forgiven the Court Physician for the botched surgery, High King Eirik had not. 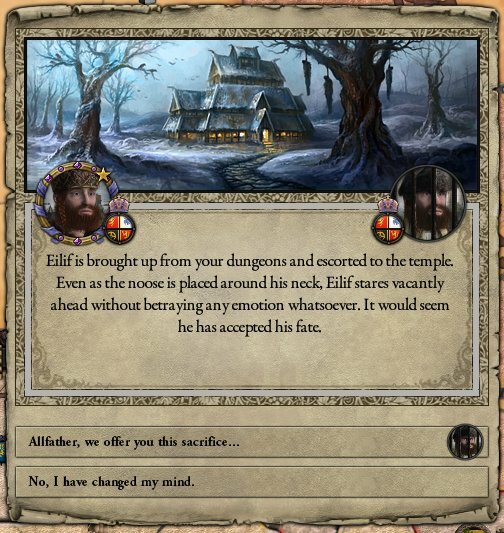 A cruel and wrathful man, the new monarch ordered the arrest of the medic, who would languish in the dungeons in Castle Lade awaiting his fate. The condemned healer would not have to wait long to find his future. Removed from the dungeons along with prisoners from war and raiding, they were strung up and offered to the glory of the gods. The instability of succession had led to many minor lords joining factions in the hope of diluting the crowns power. 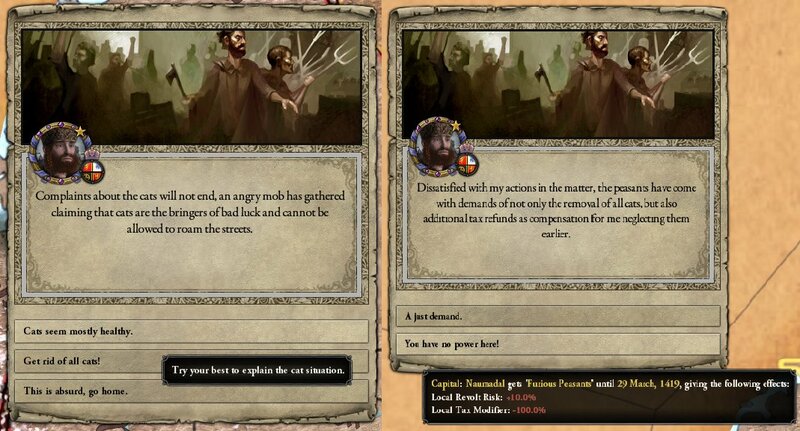 This time however, powerful kings were in their midst, able to bring great power to their faction. 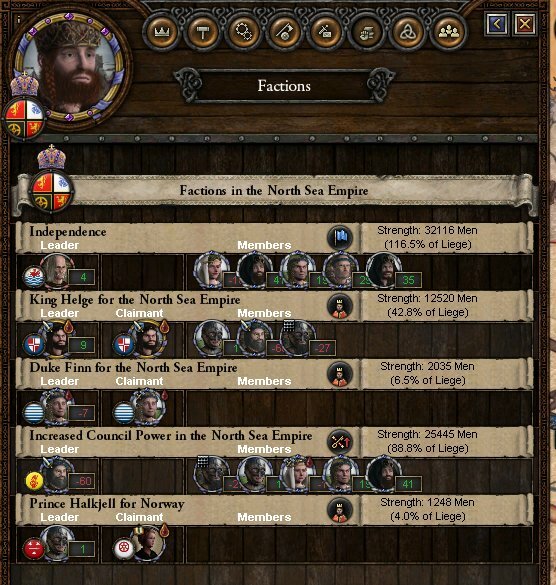 However, the solution to these troublemakers had been perfected over generations, and once more gold flowed from Castle Lade, buying loyalty all the way from the lowly priests and mayors to the brothers of the High King himself. This gold had to come from somewhere, and the most common place was from the coffer of southern Catholic rulers. 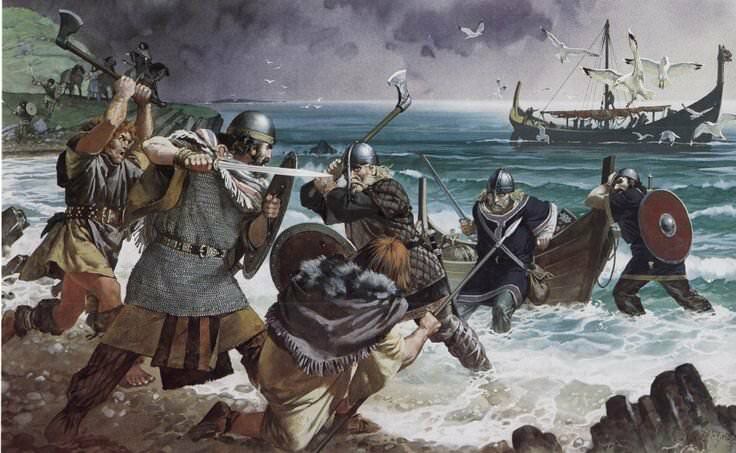 Leading the Félagi Auðr on raids all down the coast to Iberia itself, the High King reminded the other rulers that the fury of the Northman may rest, but it is never gone. 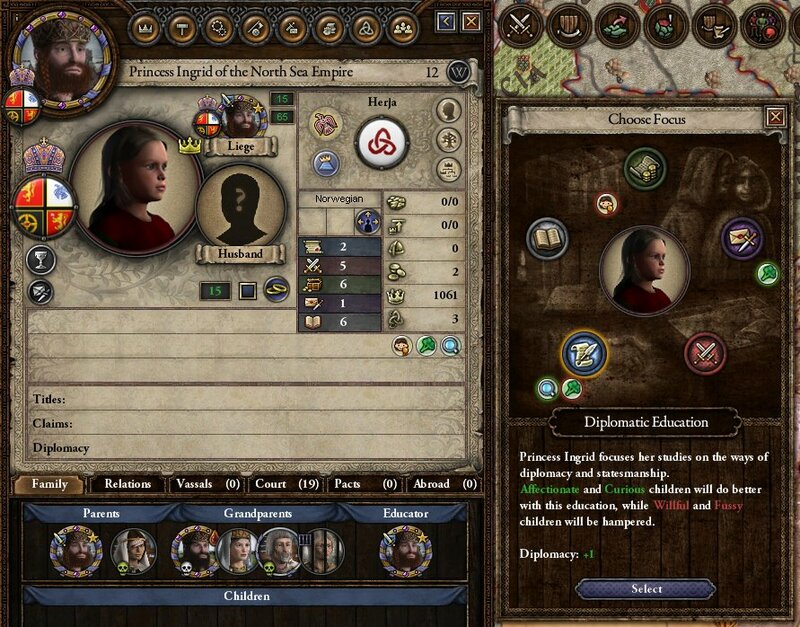 Despite the High Kings betrothal, there was a very likely chance that the next Herja to sit would be his daughter. 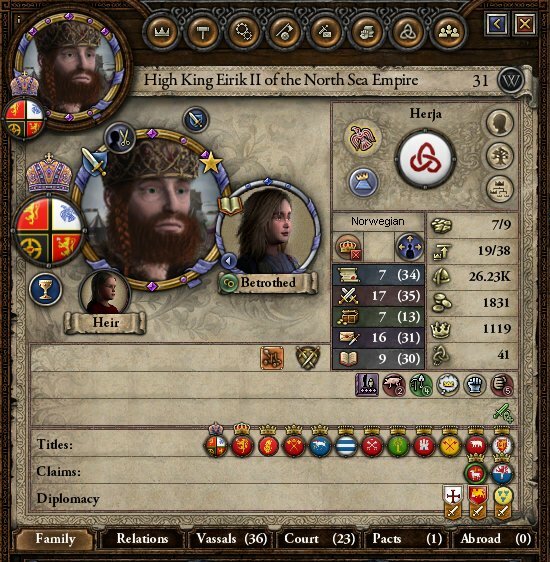 Rather than risk passing the realm to a child, High King Eirik stepped away from tradition and had his daughter from his first marriage educated by courtiers and learned men in the court. Whilst not outright naming her his heir, many began to suspect that the next to sit upon the throne in Castle Lade would be a woman. Between the Danish and the Wolves, a small Finnish enclave had a large host of local nobles rise up demanding independence for a Pomeranian dukedom. It was unexpected that these rebels would last long against the veteran Finnish levy. When a local mob of peasants gathered outside of Castle Lade to complain of the amount of cats in the capital. Initially ignored by the High King, it was not until the peasant rabble destroyed a city block that the matter was taken seriously. In an effort to improve the relationship with the infuriated peasant, the High King ordered that shrines to the Gods be raised along the roads around the kingdom. This helped reduce the peasants temper as the cat population was killed. Finally, the death kneel of the Greek kingdom was sounded when their last bastion, the Aegean Islands, was invaded by the Muslims. Having sent countless armies in her defence in the past, this time Christendom did not march to the defence of the Greeks. Alone and with nowhere else to retreat to, the last Catholic presence in the Bosporus was about to be lost. To the surprise of many, the Pomeranian rebels were able to throw back the King of Finland’s men. 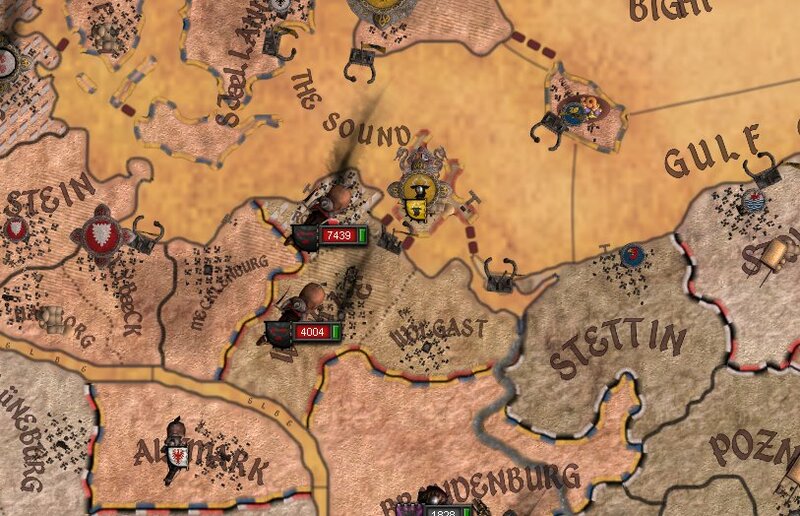 How a group of lowly peasants and minor lords were able to defeat a powerful, northern army was unknown, but none could now doubt that the Finnish would have to come to the table and grant the independence of the duchy. 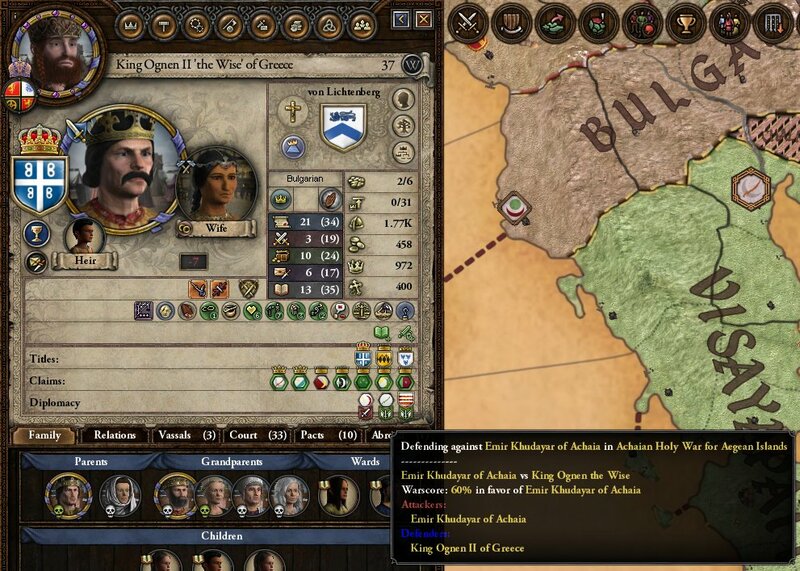 Exiled from the Greek peninsula, the King of Greece retreated to his holding in northern Italy. Still bearing the crown of his forefathers, his claim to his ancestral lands were taken about as seriously as his army was. Inspired by news from the north of the exploits of the Pomeranians, a group of like-minded peasant rose up in Great Moravia. 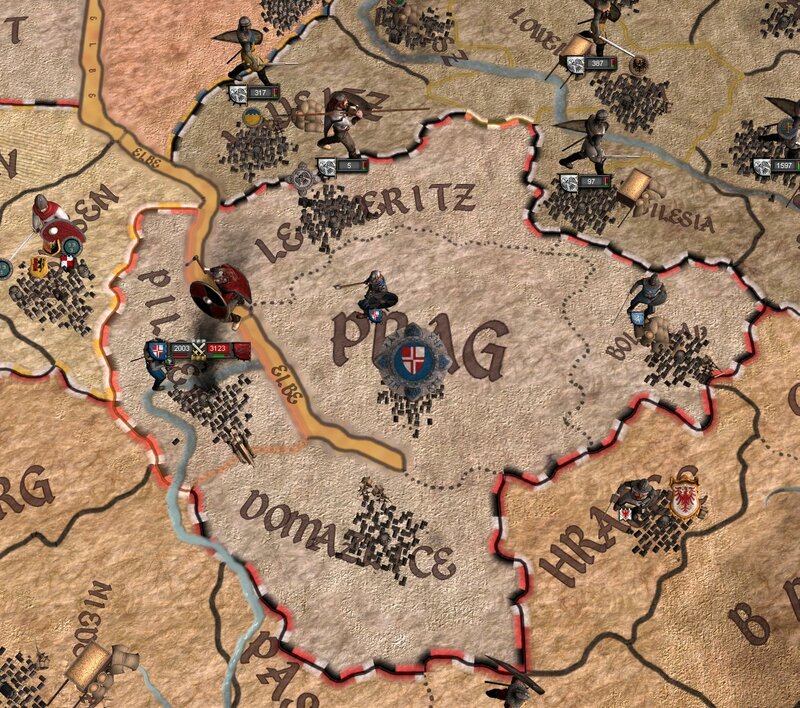 Hoping that, like the Finnish, any army sent by the High King would be defeated by the long march south. 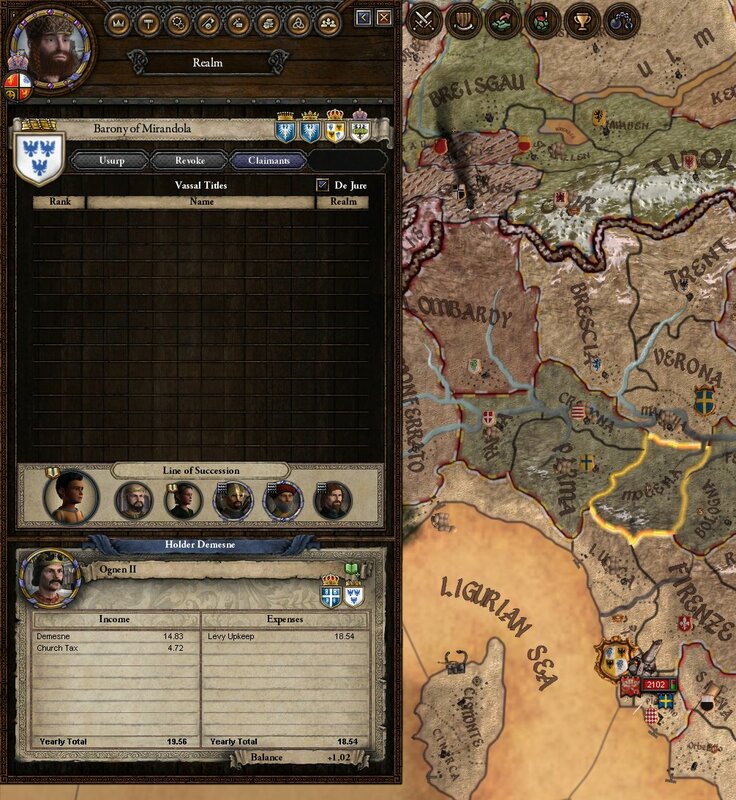 The brother of the High King, the first of house Herja to rule the lands from the ancient city of Prague, ordered his levies raised to face this new threat. An inexperienced leader, he ordered his army to march across the river that split his realm in two. Whilst crossing the river the rebels force was spotted, and the royal forces were pushed into a battle whilst unorganised. This lead to the better trained and equipped soldiers being forced from the field, in an eerie parallel to the Finnish a year earlier. With the likelihood that she would take throne becoming more and more likely, the High King would dedicate time in the day when he could to impart all the wisdom he could. Yet he knew that for all the skill she could have, many would look down upon his heir because she was a woman. Therefore, the lesson he would teach over and over again was the need to make sure that each move she made was precise and thorough. 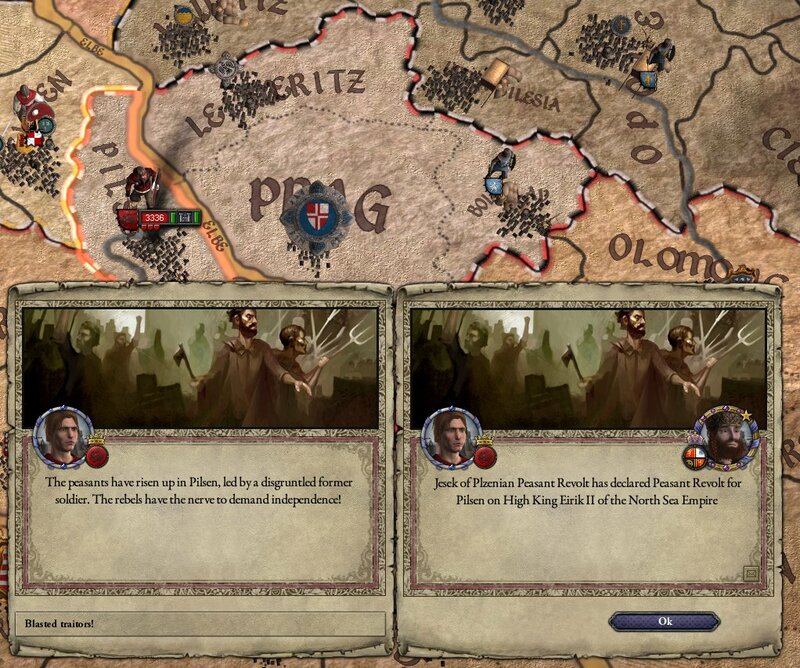 With the King in Great Moravia failing to resolve the issue of the rebellion in their own lands, the High King decided to act. 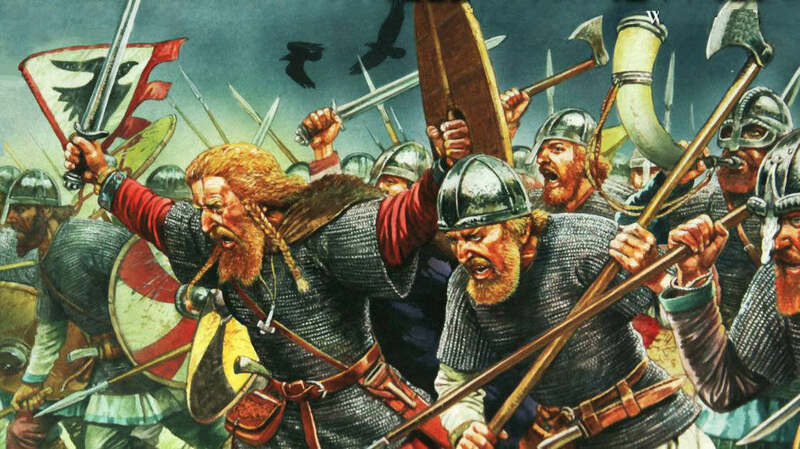 Marching south with men from Frisia, High King Eirikr put those who had risen in rebellion to the sword. 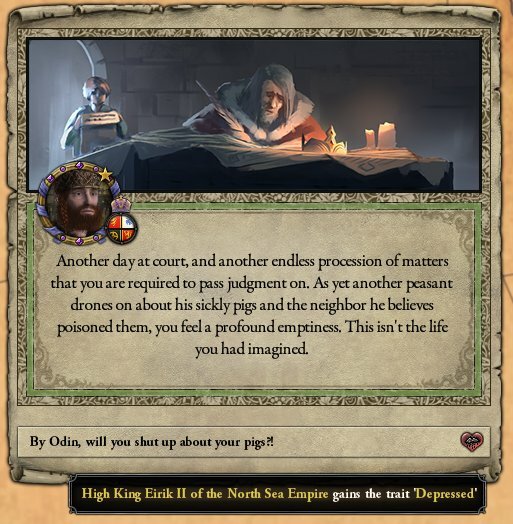 Succeeding where his younger brother had not, no doubt was left in the mind of those who would betray their High King as to the cost of such actions. Luckily the High King was able to return in time for the celebration of his daughters coming of age. A clever woman, it was becoming more and more apparent that she would be named the High Kings successor, given that he was still betrothed to another who had yet to come of age. 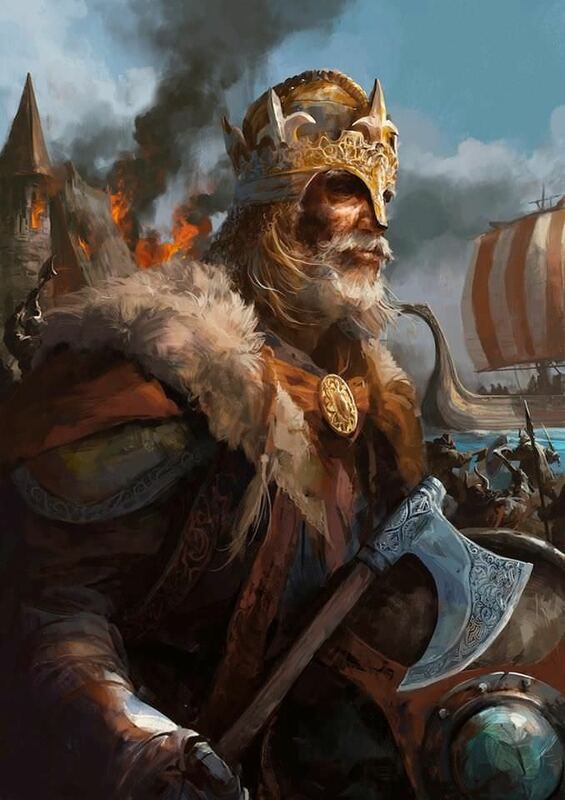 In what many saw as the first step in making this succession a reality, High King Eirik summoned his council to remove many of the laws that prevented a woman from holding office. Women, he had argued, had been responsible for the management and finances of a household for many generations. 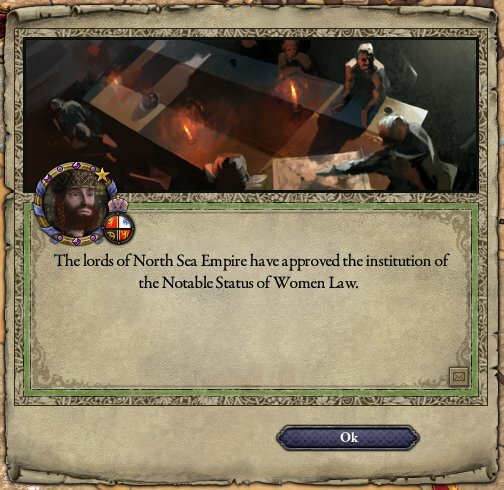 Should a woman of royal blood therefore, not be responsible for the royal household and the realm itself? 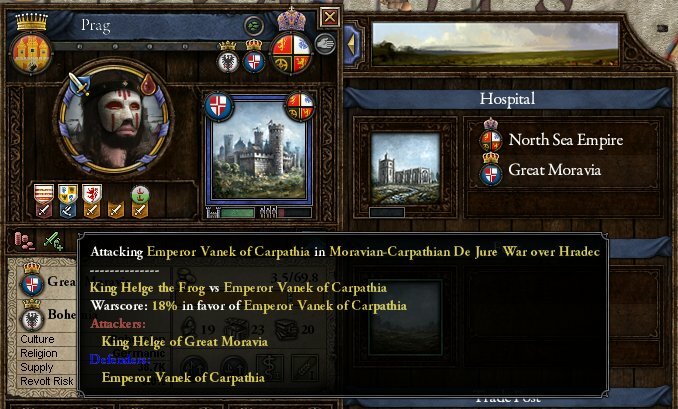 Apparently not learning from his mistakes in the peasant rebellion, or seeking to redeem himself, the King of Great Moravia ordered that his armies to march into Carpathia. 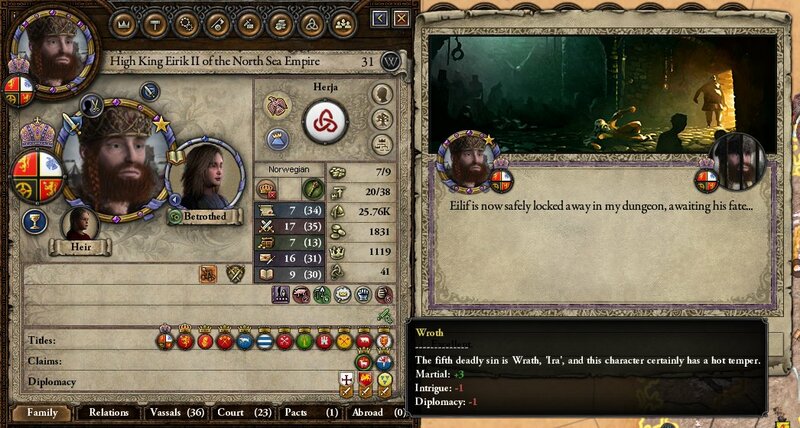 This went as well as could be expected, but this time High King Eirik did not march south, hoping that his brother would learn a lesson in defeat. .. and it was time for the world to remember the fury of the Northman.